I’m recycling this picture from last year for Wordless/Wordful Wednesday since this week I’m posting a series of recipes I make for Thanksgiving each year and thought this would fit in perfectly. 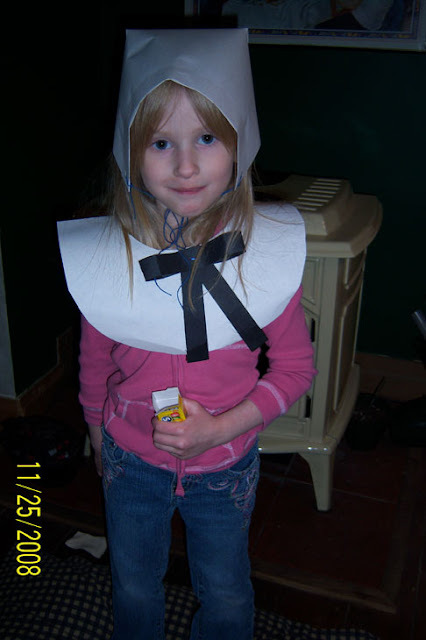 Princess Nagger made this Pilgrim hat and collar in Kindergarten last year – this was the day before Thanksgiving when she wore it home on the bus. She makes a cute Pilgrim, doesn’t she? Place apples and sweet potatoes in a crock pot or slow cooker. Sprinkle remaining ingredients on top of the potatoes and apples. Cook on low for 4 to 5 hours. 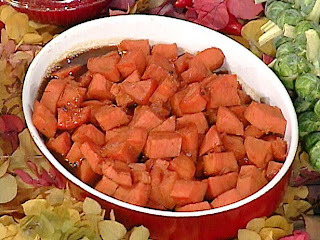 If your little ones like marshmallows on their sweet potatoes like the Princess Nagger does, about 15 minutes to 1/2 hour before serving, liberally sprinkle mini marshmallows over the sweet potatoes and recover. The marshmallows will melt nicely and make your little one happy. Place the sweet potatoes in the slow cooker. Combine the dark brown sugar, ground cinnamon ground nutmeg, and pinch of salt and sprinkle over the sweet potatoes. Stir carefully (you don’t want to mash the sweet potatoes in the process, unless you prefer them that way). Cover and cook on low for 7 hours. Add butter and vanilla; stir to blend. Once again you can melt mini marshmallows over the top at the end if you desire. There you have it! I do have three slow cookers that get used every year at Thanksgiving – I make several things the day before so on the day of I can socialize with our dinner guests and not be harried and hurried in the kitchen. I set up the dining room table in the living room, and set up buffet tables in the dining room – a power strip comes in quite handy to handle the slow cookers and leave my counters free for maneuvering other stuff. Like the turkey when it comes out of the oven. Tune in tomorrow for the delicious Cranberry Sauce with Port and Cinnamon – it’s made with fresh cranberries and can be made up to three days in advance. Another stress-reliever time saver recipe. Wordful Wednesday hosted by Angie at 7 Clown Circus – head on over there to check out all the fun wordy posts! 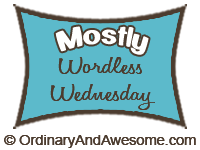 And don’t forget to stop by Sara’s, she hosts ‘Mostly Wordless Wednesday’ each week! This entry was posted in Mostly Wordless Wednesday, Recipes, Thanksgiving, Thanksgiving Feast, Wordful Wednesday, Wordless Wednesday by Stacy (the Random Cool Chick). Bookmark the permalink. Can you believe that I'm not a sweet potato fan? I love potatoes, and I love sweets, but I am not a huge fan. That is THE CUTEST pilgrim I have ever seen. That's it, I don't need to see another pilgrim because they just won't be as cute. She is a cutie.. as for the recipes, thats the husbands dept. OOOOH! I like the touch with the apples in the sweet potatoes! I have to remember that! How many slow cookers do you own?? LOL!!! Thanksgiving is probably about the only day of the year that I will really need that double oven that I bought. Love sweet potatoes and I will be trying this recipe too! PN does make a great pilgrim! Goodness…I love anything that's been slooooow cooked! :o) Yum. That capture of PN is too sweet. Love that little smile! Great costume. One loves one's slow cooker. Btw… your page is super slow to load, even the comment box takes forever. Wonder what's bogging it down so much? Love the costume! Reminds me of the Brady Bunch episode when they made the Thanksgiving movie!! She is a pretty pilgrim, for sure!!! You're just a doll with all of your linky love! This looks GOOD. Seriously GOOD. But I have a question: Just how many crock pots do you own? She does make a cute pilgrim. The recipe looks great. you know i have only the last couple years started actually liking sweet potatoes…perhaps the touch of apples would make them just right…cute pilgrim. smiles. Never thought to put apples in with the sweet potatos but that really sounds good. Yes, my kids and hubs like marshmallows in there! she DOES make a cute pilgrim! Thanks for the recipes too! I grew up not seeing them at all, but have come to enjoy them! Good recipe- I want some! That looks delicious! Have a wonderful Wednesday. Wondering if the sweet potatoes would work in a roaster for mass quantities @ a community Thanksgiving dinner? Sounds simple and yummy! Oh I love sweet potatoes! Princess Nagger is the cutest pilgrim ever! What is she going to be for halloween this year? She makes a perfect Pilgram! I love all the slow cooker recipes, a great way to do the side dishes! I may have to get another slow cooker for this year! She's an adorable pilgrim! Great recipes – can't wait for Thanksgiving! Your Princess/Pilgrim is wonderful! Such a cute picture. I think I'm going to try your recipe for slow cooker sweet potatoes. Sounds yummy! Those slow cooker sweet potatoes look great. I am always looking for recipes like this. I'm like Kristina when it comes to sweet potatoes, which is sad because my mom keeps harping on their awesome nutritional value! (growl, growl, growl). You have such talent and such a beautiful little girl! I don't think I've ever seen a Pilgrim eating dots! I love sweet potatoes! This looks delicious! great picture of princess nagger. i do not eat sweet potatoes, but i would try that recipe. happy ww and take care. Oh, nummmmmmo!! I may have to try those nummy looking sweet taters. And that pilgrim is just adorable! She could have come straight out of the 1600s. (At least from the top up. LOL) So cute! I'm definitely trying this recipe. 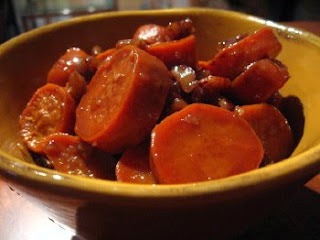 I love me some sweet potatoes, and making them in the slow cooker? Bonus! Yes, she is an adorable pilgrim!!!! And I love the sweet potato recipes! Yum! And how awesome is your recipe that it can me made ahead of time. I will be adding that to my list for Turkey Day. And I look forward to the cranberry recipe. I just ate sweet potatoes for dinner! Mmmmm! And what a cute pilgrim she is! Those slow cooker recipe sound delicious. I'm bookmarking this! Thanks! She makes a very pretty pilgrim! Another nice recipe from you. Can't wait for the other four, but I will. 🙂 Btw, you really have a lovely daughter. seriously that is soo cute! She makes an adorable pilgrim! I'm might just give this recipe a try!